Quick Electrical Fixes Vs. Professional Help | Piper Electric Co., Inc.
We all know home electrical issues can be a pain. Whether it be a minor wiring issue or a full-on power outage, homeowners are bound to encounter several home electrical repairs in their lifetime. But when is it safe to fix electrical systems yourself and when do you need professional help? 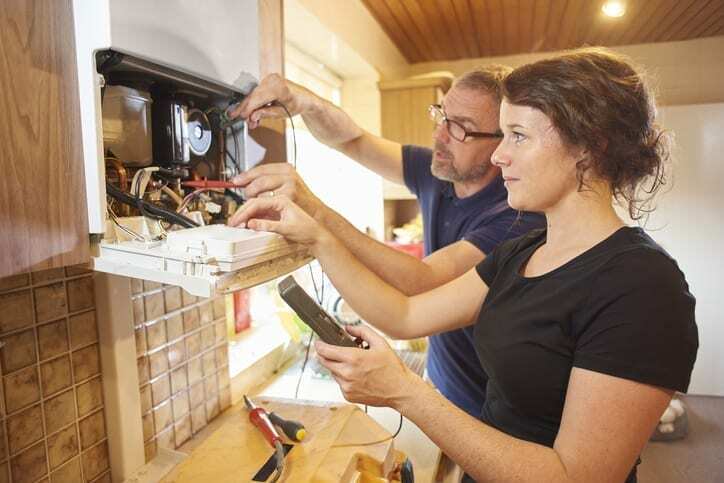 In order to avoid costly (or potentially dangerous) home electric repairs, here are a few tips to gauge whether you should DIY or call a pro. When it comes to replacing an electrical outlet, light switch, or light fixture, most packaging comes with easy-to-follow installation instructions. The only additional knowledge a homeowner must have is a basic understanding of the projects wiring and how to cut the power. For these quick fixes, you’ll likely only need a screwdriver and some wire crimpers, and can have things done in less than 30 minutes. For larger, more risky installations (such as high suspended light fixtures) it may be in your best interest to call an electrician for help, especially if the project is out of your comfort zone. No power in the outlets around your kitchen or bathroom? Look for the outlets with ground fault circuit interrupters (the ones with black and red buttons on them) and press the button that says RESET. These GCFIs are a safety measure to prevent electrocution when currents fluctuate. Fluctuations can occur for a multitude of reasons, but the introduction of water to an outlet is a major reason GCFIs are tripped and power is shut off. So give that button a push before hiring a professional to fix the problem. Say the power shuts off in one room of your house, what do you do? Don’t freak out, the fix is simple. Oftentimes, this just means a circuit breaker has tripped. All you need to do is unplug the appliances in the room without power and head to the basement (or wherever your electrical panel is located). Open it up and look for the breaker that is in the “off” position and flip it back on. If the problem ensues, then it might be a good idea to call an electrician as this could indicate faulty wiring. If an outlet or switch becomes hot to the touch this could mean there are a combination of issues. If the outlet has too many devices plugged into it, then the obvious first solution is to take them out. If you look inside the outlet and see damage to wiring, you can also try to replace those. If the problem persists, then you’ll likely want to call a professional to avoid lasting burn damages around outlets or even a potential house fire. If it’s just one light bulb, then there’s likely just a problem with the connection between the bulb and socket. However, if it’s entire sections of your house the most common diagnosis for flickering lights is oftentimes loose or faulty wiring. While flickering lights may not seem like a major electrical issue, loose wiring is a major cause of house fires around the country. Be sure to turn off the lights in question at the breaker box before removing them to check for wiring issues. If the wiring is frayed or damaged, it’s advisable to call an electrician. No point electrocuting yourself over a couple of flickering lights! When looking at any home electrical project, it is important to have a base understanding of the wiring and layout of your home’s electrical system. Sure, watching DIY how-to videos on YouTube is a good way to save some money, but some fixes will not be visible to the naked eye and will require more professional attention. Don’t put yourself or your home in harm’s way! Call an electrician if you are uncertain of any problems you have! Looking for an electrician? Piper Electric Co. Inc. has served the Greater Denver area for more than 35 years and offers commercial, residential, and industrial electrical services right to your doorstep. Based in Arvada, Piper’s award-winning services include a 24-hour emergency service and free estimates. Don’t let your home electrical issues go unchecked, call Piper Electric Co. Inc. and we’ll handle it for you ASAP.